Mom And Daughter Cakes: Umbrella Cake - Hope It Rains Tonight! Umbrella Cake - Hope It Rains Tonight! Hi reader, long time no see, hope to catch up with you more this week. Will it rain tonight? Emm..I don't think so. 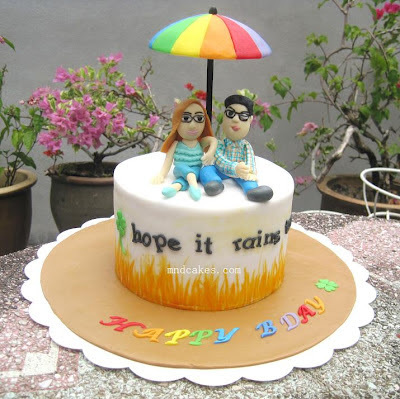 But, I truly like the idea of my client who had given me the idea of making an umbrella cake. It's for her best friend's birthday. The umbrella was crafted using styrofoam, the rest was cake and sugarcraft. 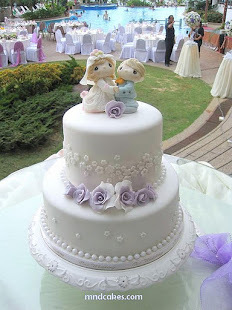 What a colorful, beautiful and romantic cake! Excellent work! Bravo!